DVD Synopsis: The frightening and realistic tale of an innocent girl inhabited by a terrifying entity, her mother's frantic resolve to save her and two priests--one doubt-ridden, the other a rock of faith--joined in battling ultimate evil always leaves viewers breathless. This greatest supernatural thriller of all time astonishes and unsettles like no other movie. One day back in 1983, I was visiting a friend’s house, and a bunch of us were sitting around in his living room when someone suggested we pop a movie into the VCR. How about The Exorcist, my friend’s brother suggested, to which my friend immediately said “no”. It seems he had seen William Friedkin's frightfest just the night before, and it scared the hell out of him. But his brother was pretty persistent, and since most of us had never seen The Exorcist, my friend was out-voted by about 8 to 1. So, as he sat with his head buried in his hands, the rest of us were watching Linda Blair flailing, spinning and spewing. Well, it wasn’t long before I was covering my eyes, and I wasn’t the only one. Those images proved to be very traumatic for me; because of The Exorcist, I wore a holy medal around my neck for two solid months. In fact, I’ve only worked up the nerve to see this movie something like 3 or 4 times since that afternoon all those years ago, and it never fails to frighten me. 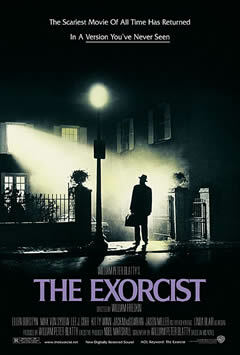 In my opinion, The Exorcist is the granddaddy of scary movies, and probably always will be.